A powerful and reliable engine is the key to the successful performance of a racing car. This is especially true of the engine of the Alfa Romeo 8C 2900B. Its designer, the famous Vittorio Jano, decided to go for an 8-cylinder in-line engine of light-weight construction. 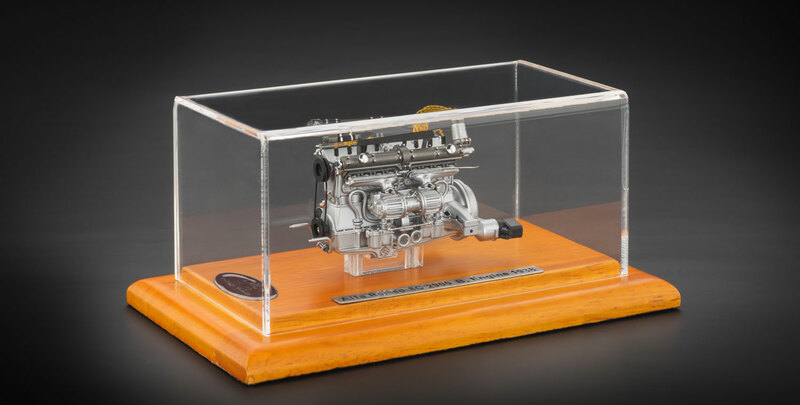 The crankcase was made of two light-metal blocks, each with four cylinders. In this design, the camshaft system that transferred its drive via a gear train was moved to the middle of the engine. As a result, the length of the camshaft was reduced by half, which enhanced the rigidity and stability of the unit parts. Each of the two cylinder blocks was equipped with a Roots-Supercharger. This motor unit comes in an attractive display case. As the newest addition to the engine series launched by CMC a while ago, it is a good example of what CMC is capable of in model building.